U.S. focused program updated to include short, on-demand education on protecting against ransomware to fit the busy schedules of healthcare staff. PITTSBURGH, Feb. 21, 2017 – As news of data breaches and phishing scams circulate, healthcare professionals may be more aware of cybercrime, but cyber attackers are becoming equally savvy. During HIMSS17, Wombat Security Technologies (Wombat), the leading provider of cyber security awareness and training, is expanding its U.S. focused Healthcare Security Awareness Training Program to include additional ransomware training to help combat the ever-changing cybersecurity and education challenges unique to healthcare enterprises. 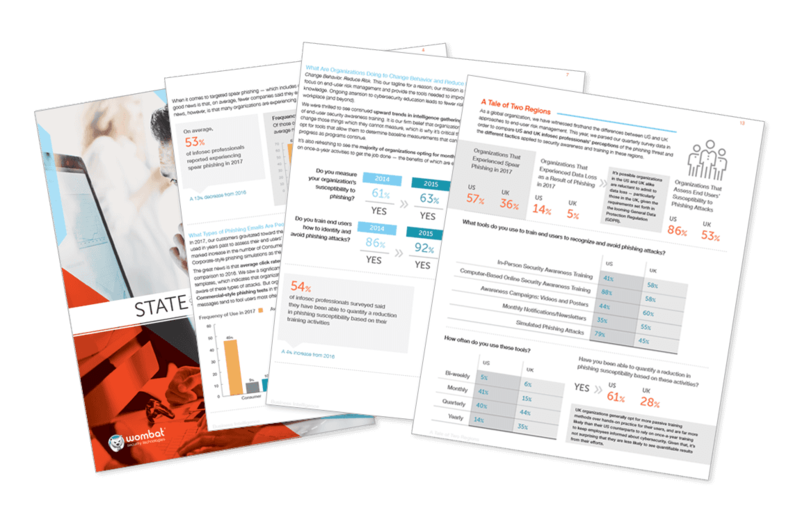 Wombat’s Beyond the Phish Report released late last summer looked at nearly 20 million questions asked and answered regarding nine different topics in their Security Education Platform. Staff in healthcare organizations did worse than average in several categories such as phishing, using the internet safely, protecting mobile devices and information, building safe passwords and even protecting confidential information where they missed more questions than any other industry at 32%. However, Wombat has also seen healthcare clients have great success, such as a recent POC that showed an 86% reduction in vulnerability from a hospital and medical center that implemented Wombat’s solutions. Protected Health Info Predefined CyberStrength® assessment not only provides a baseline measurement of staff’s knowledge about a critical topic — safeguarding PHI — but will allow teams to immediately begin to address areas of vulnerability. ThreatSim – Wombat’s simulated phishing attack tool, including simulated phishing templates that healthcare organizations might receive. Email Security – Teaches users how to spot and avoid the traps commonly found in phishing emails and spear phishing attacks. Protecting Against Ransomware – Helps end users learn how to recognize and prevent ransomware attacks, which have become a significant threat to healthcare organizations. Data Protection and Destruction – Highlights the importance of protecting data throughout its lifecycle. Physical Security – Introduces the key components of physical security and teaches staff members about their role in maintaining a safe and secure work environment. PhishAlarm – Allows email client add-in enables employees to report a suspected phishing email with a single mouse click. Users who report a suspicious message are immediately rewarded with a "thank you" pop-up message or an email that encourages this behavior in the future. PhishAlarm Analyzer - Prioritizes reported messages and streamlines response and remediation. Security Awareness Materials – Videos, posters and images that help raise awareness in healthcare organizations. Wombat’s newly released Awareness Video Campaigns contain content to keep staff members thinking and talking about cybersecurity. This new offering includes a video on protecting patient data. Each product has reporting and analytic tools to identify weaknesses and measure progress. Wombat’s Continuous Training Methodology has been shown to reduce successful phishing and malware infections by up to 90 percent. Their market-leading approach and award winning Security Education Platform currently helps over 1,000 enterprise organizations change employee behavior and dramatically reduce the risk of a cyber-attack. Those looking to learn more about security awareness and training can find the Wombat Security team at HIMSS17, February 19-23, 2017 (Booth #275) at the Orange County Convention Center in Orlando, Florida. Wombat Security Technologies provides information security awareness and training software to help organizations teach their employees secure behavior. Their SaaS-based cyber security education solution includes a platform of integrated broad assessments, as well as a library of simulated attacks and brief interactive training modules. Wombat's solutions help organizations reduce successful phishing attacks and malware infections up to 90%. Wombat, recognized by Gartner as a leader in the Magic Quadrant for Security Awareness Computer-Based Training Vendors, is helping Fortune 1000 and Global 2000 customers in industry segments such as finance and banking, energy, technology, higher education, retail and consumer packaged goods to strengthen their cyber security defenses.